There are many stories about Batman, and in nearly every story there is a Robin. 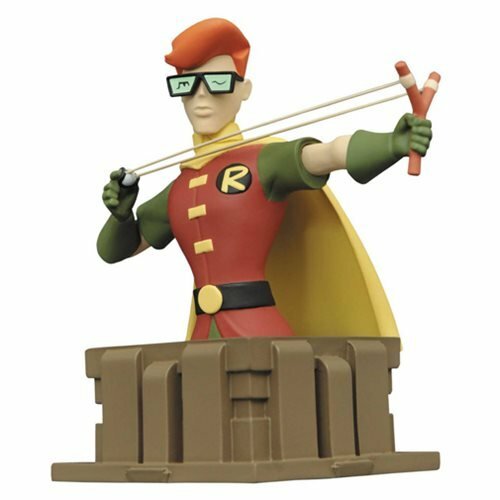 This resin bust of Carrie Kelly as Robin is based on children's stories of a dystopic future Gotham, as seen in the New Batman Adventures episode, "Legends of the Dark Knight." Measuring approximately 5-inches tall, it is in scale to other Batman: The Animated Series busts, and sits atop an art-deco pedestal inspired by Gotham City architecture. This New Batman Adventures Dark Knight Robin Bust is limited edition of only 3,000 pieces, and comes packaged with a certificate of authenticity in a full-color box. Ages 13 and up. Batman Beyond Batman Variant Resin Bust - SDCC 2017 Excl.